Inelastic neutron scattering experiments on a copper-oxide superconductor reveal nearly static, spatially modulated magnetism. Because static magnetism and superconductivity do not like to coexist in the same material, the superconducting wave function is also likely modulated in space and phase-shifted to minimize overlap, consistent with recent theory. The new insight regarding the coexistence of superconductivity and atomic magnetism will aid in the development of a predictive theory for high-temperature superconductivity, one that can assist in the design and discovery of new superconductors with improved properties. The observation of coexisting magnetism and superconductivity in a particular copper-oxide superconductor suggests that the two types of order can be spatially modulated and intertwined, supporting recent theoretical predictions. Understanding the relationship between superconductivity and a type of atomic magnetic correlation (antiferromagnetism, wherein neighboring atomic spins are oriented in opposite directions) remains a challenge. The magnetism is associated with the localization of electrons, whereas superconductivity is a state in which electrons are paired and can flow without resistance. Previous experiments have shown that these two states do not like to coexist in the same space. Researchers from Brookhaven National Laboratory characterized slow magnetic fluctuations in a copper-oxide superconductor. Their discovery shows that the slowly fluctuating magnetism does not disappear in the superconducting state; in fact, it grows stronger at the lowest fluctuation frequencies. The state of intertwined superconductivity and antiferromagnetism that has been proposed by theorists provides a likely explanation of the observations. These results indicate an intimate connection between superconductivity and magnetism in copper oxides, an important clue for developing a predictive theory of high-temperature superconductivity. This article and the other superconductivity article published today confirm a theory I have proposed in many Physorg posts starting in 2010. My theory is based on Art Winfree's theory of coupled periodic oscillators, which I have borrowed and repositioned to physics. The two waves, blue and green, are both periodic oscillations. They are coupled precisely: the maximum of one function occurs when the other passes through zero. For more, please see my post at today's other superconductivity article. Or any of my prior posts on Winfree's law, which may be found through Google, using a search term of Macksb Winfree Physorg. 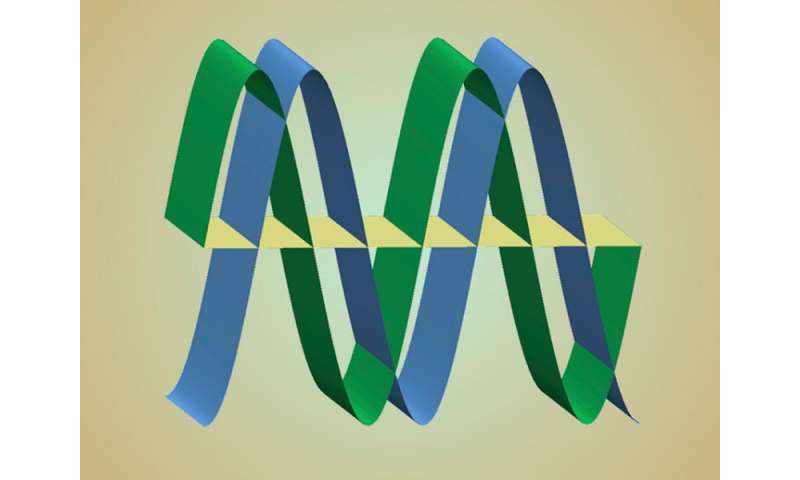 Art Winfree's law of coupled periodic oscillators (the blue and green waves) usually deals with patterns formed by groups of identical oscillators. The above example deals with periodic oscillators that are not identical--and in this case have another characteristic, namely a competitive quality. One will dominate the other. As you can see, when a blue wave is at its max (up or down), the green wave is at its minimum--zero. And vice versa. This tells us several things. First, as I have long proposed, Winfree's law applies to physics. The blue and green waves both exemplify Winfree patterns--coherent periodic oscillations. Second, his law applies to superconductivity. Third, the mechanisms of superconductivity and magnetism (here, antiferro variety) are related, and both obey Winfree's law. Fourth, the magnetic Winfree pattern and superconducting Winfree pattern interact. They can only co-exist with exquisite cooperative timing, which the blue and green waves display. The blue wave and green wave appear to be 90 degrees out of phase, which creates a Lissajous curve. See Wikipedia entry for Lissajous Curve, and particularly the subheading Application for the case a = b. In that section, see the moving illustration on the right side with a red wave (the input signal) and a blue wave (the output signal), which generate a Lissajous curve when the output blue is plotted as a function of the input red. In such a case, where there is a 90 degree phase shift between the two waves, the Lissajous curve is a perfect circle. It would be interesting to see if other superconductors have similar features.